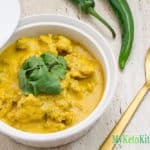 Keto Curry Chicken - Low Carb Indian Recipe - "Easy" to Make at Home! This Indian Keto Curry recipe is Delicious & Mildly Spicy with "Special" Low-Carb Ingredients. Lots of Healthy Fats & Easy to make. The low-carb and higher fats actually make the curry more "flavorsome". In your food processor, add the onion, green chili, ginger, garlic and fresh coriander. Blend until all ingredients are finely chopped. If your food processor is struggling, add a tablespoon of oil or water to help the ingredients move around. Scrape the mixture out of the food processor and into a large saucepan over low heat, add the ghee and gently saute for 10 minutes. Add the turmeric, cumin and ground coriander and continue to gently saute for another 5 minutes. Add the tomato paste and stir well to combine with the other ingredients, continue to cook for another 2 minutes before adding the diced chicken. Increase the heat to medium and cook the chicken in the spices for 10 minutes. Add the cream and salt, and reduce the heat until the curry is simmering. Simmer for 20-25 minutes until the chicken is cooked through and the sauce has thickened. Serve the Easy Keto Indian Chicken Curry immediately with a side of Cauliflower Rice.